A battling wing-half who easily embraced the wider disciplines of midfield play as tactics changed in the '60s, Mick Hughes became a much-loved character at the Rec, and was popularly known as 'Blodwyn'. Mick started his career coming through the ranks at Cardiff, who gave him one solitary league game before releasing him. Exeter City stepped in and two years there saw him make 36 starts. 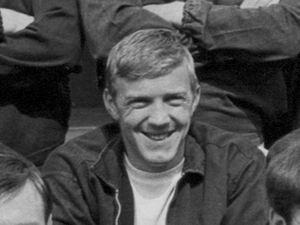 He joined The Spireites on a free in the summer of 1963 and stayed for six seasons before finding his role in the side taken by Dan Archer. Hughes was a fine ball-winner, and always looked to make himself available for a pass, but preferred to work the ball forward with short passes, rather than attempt anything too adventurous. Apart from being a player of great strength and determination on the pitch, he was valued for his effect on morale off it, and a move into the coaching side of the game was always likely after his full-time playing career finished. He became Yeovil's player-manager in April 1969 and was Torquay's trainer/coach for two years from 1972, later managing at Salisbury City (1978) and Cirencester Town (1983). In 1986 he became Brighton's Chief Scout, but later returned west to become a Football in the Community officer at Yeovil Town. For Chesterfield: 208+2 League appearances, 9 goals.